The City Council is allowing itself to be distracted by the shiny (and possibly dangerous) object — e-scooters — rather than focusing solely on legalizing e-bikes so that delivery workers aren’t continually targeted by police for doing their job, a Brooklyn council member said Wednesday. Just before the City Council’s transportation committee was about to take up six bills about e-scooters and e-bikes, Sunset Park Council Member Carlos Menchaca blasted his colleagues for not legalizing e-bikes first — and only later debate whether scooters are safe in the urban mobility environment. “I am frustrated that the important efforts of the delivery worker justice organizers is being co-opted by tech companies,” Menchaca said, referring to such scooter firms as Bird and Lime, which are lobbying intensely to get their electric-powered short-trip devices legalized. 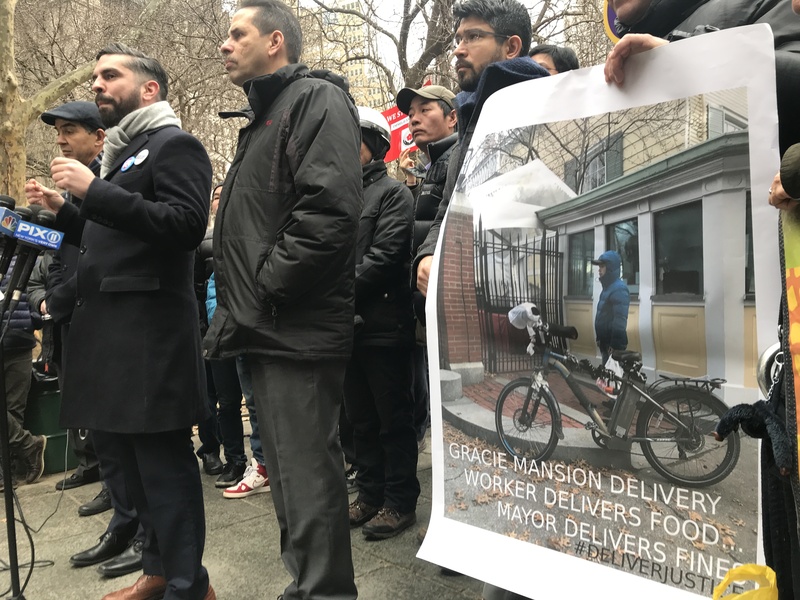 Delivery worker advocates such as Make the Road New York and the Biking Public Project have been struggling for years to get the workers’ struggles on the agenda. Menchaca said he was frustrated by a bill that would create a city program to convert throttle-controlled e-bikes — which are favored by delivery workers because they help make many deliveries over wider terrain — into pedal-assist e-bikes, which are slower. “It’s saying if you use two wheels to deliver food, we will make it harder for you — but if you use two wheels and a smartphone to get to a coffee shop, we’ll make it as easy as using the app,” Menchaca said, standing next to his colleague, Rafael Espinal, who sponsored the bill in question. Menchaca said he believes there is not enough evidence that e-scooters — which have been deployed in many cities around the country — reduce the amount of driving. But Bird and Lime have constantly claimed that their devices do indeed reduce car use. Phil Jones of Lime added that e-scooters are an important tool for making sure everyone has better transit. “We believe that citywide access to dock-free bike and scooter options for all New Yorkers will significantly help improve the city’s transportation equity crisis,” he said. The company’s own survey of its riders shows that 30 percent of its e-scooter users claimed they used the device instead of a car. And Portland’s own DOT did a study that showed that scooter use caused large declines in personal car or taxi trips. Menchaca was unconvinced. City DOT Commissioner Polly Trottenberg echoed Menchaca’s concerns in her testimony on Wednesday. There are only anecdotal reports about scooter safety — and the anecdotes aren’t very promising. The federal Centers for Disease Control is preparing to study the health implications of scooter use in Austin, Texas, a widely anticipated report. “I am here to make sure the voices of the workers don’t get drowned out,” Menchaca added. More than 1,200 delivery bikes — which can cost low-wage workers $1,800 — were confiscated by the NYPD last year. Do Lee of the Biking Public Project said it can take a worker 50 hours to make up enough money just to pay the city fine to get his bike back — and that’s at the expense of making any money for food or rent. City Department of Transportation Commissioner Polly Trottenberg testified that the city is against any e-scooter or e-legalization bill until the state legalizes the devices, which Gov. Cuomo has proposed. Electric bicycles stop fine. The heavier the bike, or the higher expected speeds generally the bigger the brake rotor and hydraulics (the same goes for certain types of traditional bicycles, like downhill set-ups). Electric bikes also benefit from regeneration and friction from the motor when it comes to stopping power. Screw this guy. E-scooters are no more a toy than e-bikes. What a condescending prick. I rented an e-bike, something that looks like a scooter, in China. It had 3 “gears” which were really speed limiters. 3rd gear started just as easily as 1st from a stop, but 1st wouldn’t go faster than about 10mph, 2nd up to maybe 20, and 3rd up to 30, ballpark. It would be really easy to disable the top gear for American purchases. I don’t care if they look like bicycles or look like scooters. They take up a lot less road space than cars. Just like bicycles, once everyone gets used to them, they aren’t more dangerous. Anything is dangerous when it’s new and unfamiliar. If you’ve never seen a knife and I hand you one, you’ll cut yourself. We shouldn’t outlaw kitchen knives, though. Yes. Electric scooter are extremely popular in Shanghai. I guess they are a different form of throttle e-bikes (that look like scooters rather than bikes). They clearly have place in urban transit but it has a very different feel than bike friendly city. There are lots of dockless bike share bikes around, but you see far more e-scooters on the road (at least in winter when I was there). My persistent question regarding e-scooters is, if they are really that great, how come it seems that next to nobody actually owns one? They are portable, small enough to carry onto public transit, into the office etc. Bike-share makes sense to me: people don’t want the hassle of locking up a bike, keeping it outside etc. A bike is a rather big piece of machinery after all. An e-scooter circumvents all of these problems. Furthermore a scooter is so small, hardly an inconvenience to own/store, so why all this rental business? It makes about as much sense to me sharing skateboards, or rollerblades. I.e. wouldn’t it make far more sense for people to have their own? As a legal immigrant who has been required to provide an additional pile of paperwork and show up in person to the DMV every time I need to renew my license, I assure you they can’t, unless it is fraudulently. I have an e-bike with throttle and pedal-assist. I removed the throttle to avoid trouble but can assure you that what you just stated regarding pedal-assist vs throttle is 100% false. It doesn’t matter whether you’re using pedal-assist or a throttle. A motor doesn’t just all of a sudden pump out more power if you choose to use a throttle. Throttles allow you to accelerate faster out of the gate because you don’t have to wait for the pedal-assist sensors to kick in, which can take anywhere between a quarter rotation to sometimes 1 full cycle. If I were to throw my e-bike into granny gear(which I can’t because it’s a single-speed), I’d be able to accelerate just as fast as if I had a throttle because I’d be able to trigger the sensors faster. You seem to be conflating all e-bikes into one category, but not all e-bikes are made the same either. Some e-bikes max out at 15mph, some max out at 28mph. A throttle on an e-bike that maxes out at 15mph is not dangerous. Why can’t we have both? Menchaca has a important point about class though that shouldn’t be ignored. Unfortunately, delivery workers cannot pay the Mayor big bucks the tech cos can. Remember, only when Citibikes was bringing their ebikes last year, the Mayor went out of his way to “legalize” ebikes while NYPD precincts kept posting about confiscation of all kinds of electric vehicles. And this practice is thought to have begun after a old white dude from the UWS complained to the mayor on a radio show about these “fast” ebikes- one white guy vs lack of any stats that say ebikes cause more accidents- and the white guy wins. It is astonishing how the “Capital of the World” is so regressive when it comes to encouraging any kind of alternative transport including EVs. Contrast that to a city like Oslo that gives all its citizens a $1200 credit to buy a ebike even as it exempts all motorcycles & mopeds from all of its tolls in the toll ring- that’s real progressive thinking where they give people efficient alternatives to cars. We are so far behind. My folding e-bike is $1800 and it has regular rim-brakes. I’m not sure what’s your problem, regular bikes go over 20mph quite easily and break on regular V-breaks just as easy. Hey, I just ordered an e-bike, Blix Vika+. It comes with a throttle and I want it removed until (at least) NYC legalizes it, because I don’t want NYPD taking it away after I paid $1800. Do you know who can take it off in Brooklyn and how much does it cost? I’m pretty sure if you duct tape it so it can’t move you’ll be OK. If/when NYC legalizes throttles, you can remove the tape. Well, I’d rather have it removed, I’m not entirely sure NYPD buys into tape stuff. If they go full bureaucrat mode, they will insist it still has a throttle. It probably depends on the shop, but I don’t imagine it costing anything more than a few bucks — I’m not sure how the Blix Vika+ is setup, but the setup is probably not much different than mine(Evelo Quest One). The throttle itself is typically a short wire that connects to another wire. See the first image at this site. You should be able to easily disconnect the throttle and slide it off your handlebars. You’ll have to also slide off your grip which is the more annoying part. It takes less than 1 minute though once you’re used to it. If you’re planning on leaving it off, I recommend just capping the open end with something(tape) and maybe zip-tying it around another cable so it’s not a hanging wire. I’d also recommend carrying the throttle with you just incase you need it(ex. chain popping off). It’s so small and easy to swap on and off, it’s usually worth holding on to. End the Racist Ebike Money Grab ! !